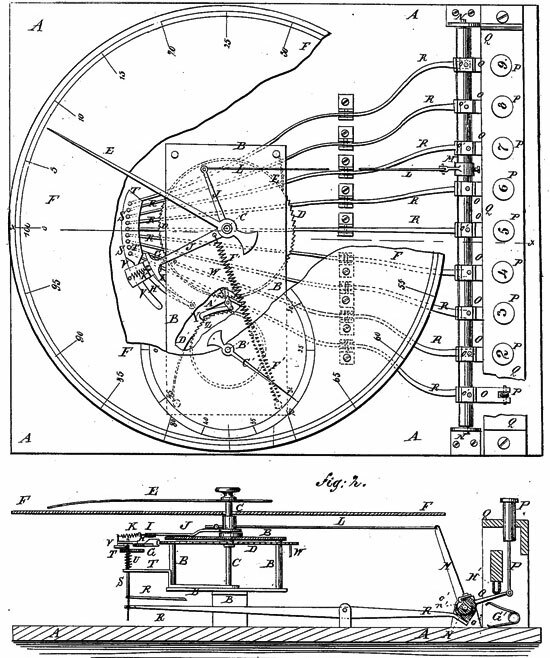 In 1878 William Patterson Borland, native of Baltimore, who lived in Leavenworth, Kansas, and Herman Hoffman, a watchmaker in Leavenworth, patented a one-column key adder (see US patent 205993), similar to the earlier Adder of Marshall Cram and to the later Centigraph of Arthur Shattuck. Let's examine the mechanism of the device, using the patent drawing (see the lower drawing). The units and tens of the numbers added are indicated by the pointer E, and the hundreds are indicated by the pointer C'. The levers O are raised into their normal position after being lowered by the operator by means of springs G' attached to the base A, and which rest against the lower side of the levers O. As the levers O are raised by the springs G' they strike against a pad, H', of rubber or other suitable material, attached to a bar of the keyboard frame, so as to prevent any jar or noise when the said levers return to their places after being operated. What is known about the inventors—Borland and Hoffmann? Almost nothing is known for Herman A. Hoffmann—he was a local watchmaker in Leavenworth and died on 13 Oct. 1889. For William Borland however, there is some information. William Patterson Borland was born in 1827 in Baltimore, to Thomas Borland and Catherine Ogle. Thomas Borland was a Scotch-Irish Presbyterian, who came to Baltimore from the north of Ireland about 1800 and was naturalized in 1805. He came to USA on the death of his parents and was adopted by his mother's brother, William Patterson, a super-cargo merchant of Baltimore, owning a line of sailing vessels and trading in the East Indies, dealing principally in tea, sugar, spices and molasses. Thomas Borland later became a partner in the business, the firm being Patterson and Borland. Patterson Park in Baltimore was named for this William Patterson, but his chief claim to fame is that he was the father of Elizabeth, "Glorious Betsy", who married Jerome Bonaparte. In 1818 Thomas Borland married Catherine Hall Ogle of Cecile County, Maryland. They had two sons, Thomas Borland and William Patterson Borland. Thomas died young, while William, who was born 1827, worked as a merchant in Benton County, Lindsey Township, Missouri, in early 1850s and married Elizabeth Hasson, also of Baltimore, in 1856. They moved to Warsaw, Missouri, where William served as a cashier in Mechanics Bank of St. Louis, Warsaw branch. In 1858 they moved again, this time to Leavenworth, Kansas, where they lived until his death in late 1880s. There had five children, Thomas, Mary, Katharine, Elizabeth (1862-1941) and William Patterson Borland, Jr. (1867-1919) (a famous US Congressman from Missouri).